Various ingredients like dates, almond butter, oats, dried cranberries, maple syrup and cocoa powder; make this recipe perfect for on-the-go mornings, or in the car in between meetings. Place all ingredients in a large food processor and pulse until a thick “dough” forms. 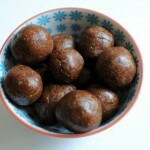 If you are making balls, roll dough into small balls and place in the refrigerator until you are ready to enjoy! If you are making bars, press dough into a small square baking dish and refrigerate for at least one hour before cutting dough into bars. Refrigerate until ready to enjoy.